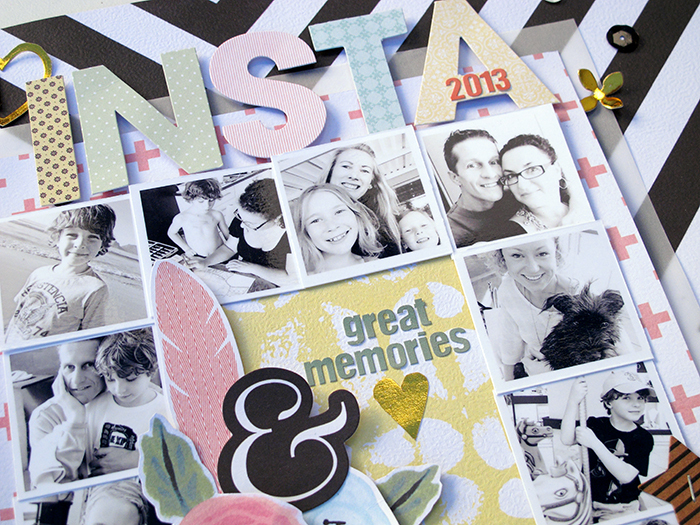 kim watson ★ design ★ papercraft: Capture those Insta photos with Fancy Pants Designs. Capture those Insta photos with Fancy Pants Designs. Is your phone full of everyday life photos & ordinary stuff, shot on the fly? Oh boy mine is...& I am always on the look out for ways to capture a whole bunch of them in one go, on one layout that isn't a double page. This was the result, x12 photos- woohoo! By arranging the photos in a square frame & leaving a square free in the middle filled with patterned paper & a few pretty accents from the Office Suite Collection from +FancyPantsDesigns; creates the feeling of space. Don't you just LOVE those over sized patterned die-cut alphas? Gold die-cuts & small shapes scattered around the page & effect of the soft colors on the graphic black & white stripe, has a great fresh feeling! Fancy Pants Designs Gold foil paper is the best substrate for die cutting with metal dies! I used Amy Tan & Little B Designs here. Hands down this page design as my new favorite way to capture an overview of an entire month's photos. Looking for the Office Suite collection?